Lot’s of this going on! Love it!!!!! Current WALK-ON TRIPS are booked solid….will be putting up more soon!!!!!! Thursday’s walk-on was a charm! Lot’s of great fish on surface and jigs! Folks, the summer light tackle game is in to full swing in a great way! I love fishing away from the crowd with light sticks and artificials. It’s on right now! Out of Solomons or Deale I’ve been running and finding some great fish active on the surface or on structure. When the weather is right the game has been on big-time! 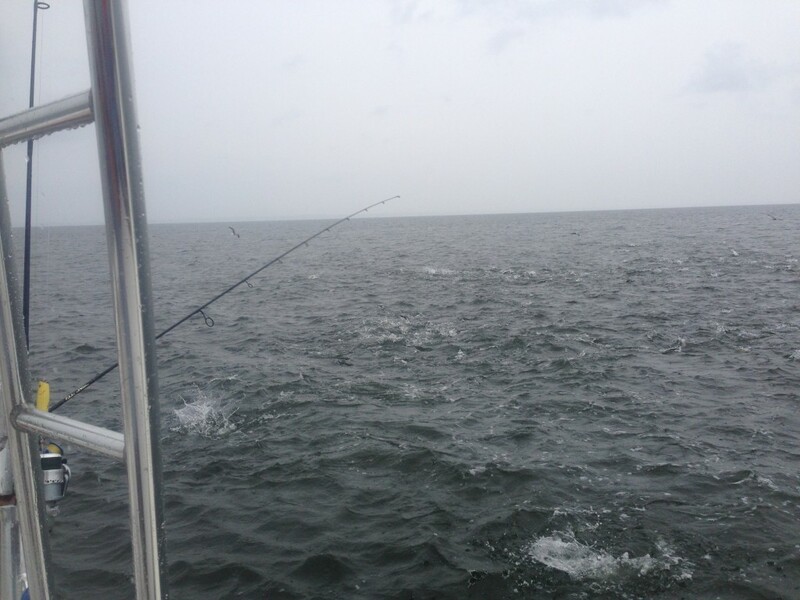 Breaking fish have included alot of just below legal Stripers and many blues in the 2-3 pound range. However, on many occasions I’ve been getting on top of some huge (to the chesapeake) blues and many keeper size Stripers. Blues to 7 pounds have been pounding surface lures and jigs or anything dipped in the water and moved. Watch out! Those things are monsters! On light tackle it’s one hell of a pull! For me the western side of the bay has produced good numbers of Spanish Macks casting with Specialized Baits’ 1 Ounce silver Lil’Bunker Spoon. I llike to throw them out over a school of breakers….let it get down for a few seconds then rip it back with a bit of pause intermitantly. Those Macs really pull on light tackle! I’d love to be chasing Specks and reds in the island but they just arean’t there in enough numbers for me to confidently say we’ll catch’m. However, for any crew that wants to give it a shot…..I’m ready! It wouldn’t shock me one bit to catch a 1 to 6 specks on a trip. Also wouldn’t shock me to catch zero. So……currently I’ve had a hell of a good catching game with nice fish out of Solomons or Deale. Live lining is still in full swing from Poplar and to the north. Possibly some activity is happening south of there. Breaking fish have been in great numbers but still schools of keeper size stripers are lacking but can be found with plenty of miles put under your boat. Most trips I’ve been catching a limit of keeper stripers along with a slew of Blues. My last trip I had some folks who wanted blues for the smoker….they kept 25 blues over 4 pounds and several up to 7….some real tackle busters! Good stuff!!!! Buzz’s marina to the south out of Ridge, Md is catching great numbers of blues and spanish mackeral with some sub-legal stripers mixed in. A great place to go to be out of the crowds and get some great bent stick! Love Mike and Christy down at Buzz’s! Mike will give you a real time dependable fishing report anytime you launch from his ramp……go on down and give it a shot! Trips lately have been producing lot’s of Stripers and Blues on light tackle along with some Spanish Macs! Good stuff!!!! Short notice cancel for Tuesday and an open date on wednsday equals some walk-on trips available now! With the bite really good and a great wind forecast I can’t resist throwing up some walk-on trips! A great chance exists to catch lot’s of nice Blues, keeper Stripers and a spanish mac thrown in for good measure. Also, some huge Red Drum are in the region and could show up under our boat. If that happens hold on!!! Cost: $120 each-all baits tackle, fish cleaning, licensing included…bring your own gear if you want…..
We will run the bay in my Judge 27 Chesapeake….great boat to chase down the fish!!!! Speed and comfort!!! Walk-on trips are a great way to get an incredible fishing trip at a great rate and meet some great folks along the way! If you are looking to learn how to light tackle jig/plug…this is your trip! Come on out and give it a shot! If you are interested in these trips give me a call at 703-395-9955 with questions or to reserve your spot (s)! Posted under "Walleye" Notes Newsletter,Fishing Report,Sticky,Trip Opening,Walk-On Trip Openings!! !